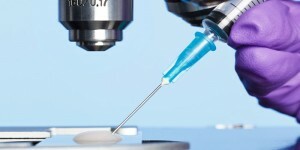 IVF patient takes injectable medications as Gonal F, Follistim, and Menopur to produce eggs. Treatment progress is monitored with sonograms and blood tests during frequent office visits. Ovarian stimulation is completed with final injection of HCG (Profasi, Ovidrel) given 32- 36 hours before egg retrieval. Rare complication caused by stimulation is hyperstimulation syndrome, the patient’s overreaction to infertility injectable medications. Oocyte retrieval is a minor surgical procedure performed under anesthesia or sedation given by our Board Certified Anesthesiologist. In the Embryology Lab, retrieved eggs are inseminated with partner sperm or a single sperm is injected into the egg (ICSI procedure). 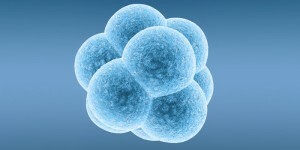 Fertilization occurs in the laboratory in a dish containing reach media to support and nourish growing embryos. 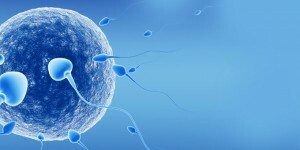 Within three to five days after fertilization, embryos with highest implantation potential are transferred into the women’s uterus. Our cutting-edge Laser Equipment attached to high power microscope increases precision of IVF micromanipulation techniques. Laser practically eliminates tissue damage impossible to avoid with standard techniques. We routinely use Laser to benefit IVF processes such as ICSI, embryo biopsy for genetic testing and Laser-assisted hatching. Embryo can be placed into the womb as early as two days and as late as five days after egg retrieval. On Day 5 best embryos are in blastocyst stage of development. Blastocyst transfer combined with assisted hatching for older patients, have best chances to attach to the receptive uterus (implantation) allowing pregnancy. SART, the US data-collecting agency, advocates Single Embryo Transfer (SET) to eliminate multiple pregnancies. 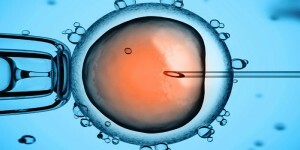 Embryo biopsy (removal a small piece from the embryo) to perform genetic screening is used by some labs before SET. Embryo biopsies that risk tissue damage and screening testing are not mandated by SART. Lower quality embryos with lower chances for advanced development in culture may benefit from early (cleavage stage) transfer to the uterus.